Vadolibero (Italy) – Press Release: We are proud to announce that, celebrating the historic Big Start of Giro d’Italia in Jerusalem, we have joined forces with the Israeli architect and artist Irma Orenstein to create an iconic symbol that will represent the 101 edition of one of the most prestigious global cycling events. With its essential and playful design, inspired by Pop Art, NEOS was the perfect canvas: the cycling station that welcomes the cyclist home after a ride, keeping everything handy for the next one. Sealing the bond between Jerusalem and Rome in the name of Giro d’Italia, the acclaimed Irma Orenstein has reinterpreted NEOS by Vadolibero with a bespoke graphic: the Giro edition. 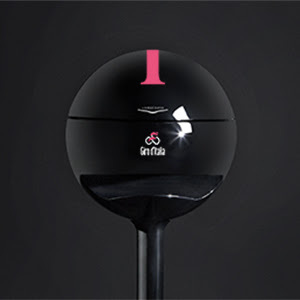 Our unique “cycling station” now wears the famous pink shade of maglia rosa and it’s marked by a symbolic capital i-shaped stripe, that stands for Italy, Israel and Irma. NEOS Giro edition will be available in three colors: pink, white and black with glossy finish. They will be on sale worldwide (retail price € 1.600) through Vadolibero e-shop and dealers (as the official licensee for 2018), the Giro pop-up stores during the race and the Giro d’Italia e-shop. The real magic is when NEOS opens. 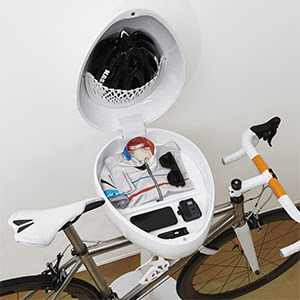 Pressing slightly the cover, the egg-shaped case reveals an organized storage space, provided with smart features: a leather net pocket for the helmet, a compartment for the small accessories, a mobile shelf where to stack the riding clothes and, below it, an inner cubby designed for the cycling shoes. Coherent with Vadolibero high-end style, NEOS comes with precious accessories. 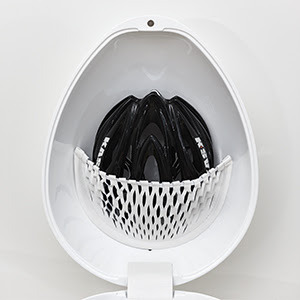 The net pocket and the saddle cover, shaped on the frame holder, are made of soft Italian leather, resistent yet flexible.